Curitiba Bus System is Model for Rapid Transit | Reimagine! Bus systems provide a versatile form of public transportation with the flexibility to serve a variety of access needs and unlimited range of locations throughout a metropolitan area. Buses also travel on urban roadways, so infrastructure investments can be substantially lower than the capital costs required for rail systems. As a result, bus service can be implemented cost-effectively on many routes. Yet, despite the inherent advantages of a bus service, conventional urban buses inching their way through congested streets don’t win much political support. The essence of a Bus Rapid Transit is to improve bus operating speed and reliability on arterial streets by reducing or eliminating the various types of delay. The bus system of Curitiba, Brazil, exemplifies a model Bus Rapid Transit (BRT) system, and plays a large part in making this a livable city. The buses run frequently—some as often as every 90 seconds—and reliably, and the stations are convenient, well-designed, comfortable, and attractive. Consequently, Curitiba has one of the most heavily used, yet low-cost, transit systems in the world. It offers many of the features of a subway system—vehicle movements unimpeded by traffic signals and congestion, fare collection prior to boarding, quick passenger loading and unloading—but it is above ground and visible. Around 70 percent of Curitiba’s commuters use the BRT to travel to work, resulting in congestion-free streets and pollution-free air for the 2.2 million inhabitants of greater Curitiba. Thirty years ago, Curitiba’s forward-thinking and cost-conscious planners integrated public transportation into all the other elements of the urban planning system. They initiated a system that focused on meeting the transportation needs of all people—rather than those using private automobiles—and consistently followed through with a staged implementation of their plan. They avoided large-scale and expensive projects in favor of hundreds of modest initiatives. A previous comprehensive plan for Curitiba, developed in 1943, had envisioned exponential growth in automobile traffic with wide boulevards radiating from the core of the city to accommodate it. Rights of way for the boulevards were acquired, but many other parts of the plan never materialized. Then in 1965, prompted by fears among city officials that Curitiba’s rapid growth would lead to unchecked development and congested streets, they adopted a new Master Plan. Curitiba would no longer grow in all directions from the core, but would grow along designated corridors in a linear form, spurred by zoning and land use policies promoting high density industrial and residential development along the corridors. Downtown Curitiba would no longer be the primary destination of travel, but a hub and terminus. Mass transit would replace the car as the primary means of transport within the city, and the development along the corridors would produce a high volume of transit ridership. The wide boulevards established in the earlier plan would provide the cross section required for exclusive bus lanes in which an express bus service would operate. Curitiba’s bus system is composed of a hierarchical system of services. Minibuses routed through residential neighborhoods feed passengers to conventional buses on circumferential routes around the central city and on inter-district routes. The backbone of the system is composed of the Bus Rapid Transit, operating on the five main arteries leading into the center of the city like spokes on a wheel hub. 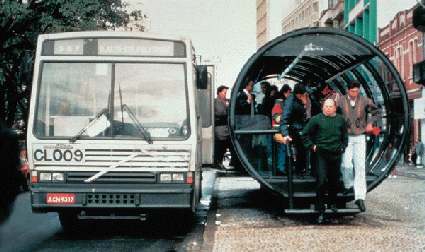 Buses running in the dedicated lanes stop at cylindrical, clear-walled tube stations with turnstiles, steps, and wheelchair lifts. Passengers pay their fares as they enter the stations, and wait for buses on raised platforms. Instead of steps, buses have extra wide doors and ramps that extend out to the station platform when the doors open. The tube stations serve the dual purpose of providing shelter from the elements, and facilitating the simultaneous loading and unloading of passengers, including wheelchairs, efficiently. This system of same-level bus boarding, plus the pre-boarding fare payment, results in a typical dwell time of no more than 15 to 19 seconds at a stop. Passengers pay a single fare equivalent to about 40 cents (U.S.) for travel throughout the system, with unlimited transfers between buses at terminals where different services intersect. Transfers occur within the prepaid sections of the terminals, so transfer tickets are not needed. Also, located within these terminals are conveniences, such as public telephones, post offices, newspaper stands, and small retail facilities. Ten private bus companies, which run the actual buses, are paid by distance traveled rather than passenger volume to allow a balanced distribution of bus routes and eliminate clogging of main roads. All ten bus companies earn an operating profit. The city pays the companies about one percent of the bus value per month. After ten years, the city takes control of the buses and uses them for transportation to parks, or as mobile schools. Curitiba’s Master Plan integrated transportation with land use planning, calling for a cultural, social, and economic transformation of the city. It limited central area growth, while encouraging commercial growth along the transport arteries radiating out from the city center. The city center was partly closed to vehicular traffic, and pedestrian streets were created. Linear development along the arteries reduced the traditional importance of the downtown area as the primary focus of day-to-day transport activity, thereby minimizing congestion and the typical morning and afternoon flows of traffic. Instead, rush hour in Curitiba has heavy commuter movements in both directions along the public transportation arteries. Other policies have also contributed to the success of the transit system. Land within two blocks of the transit arteries is zoned for high density, since it generates more transit ridership per square foot. Beyond the two blocks, zoned residential densities taper in proportion to distance from transitways. Planners discourage auto-oriented centers and channel new retail growth to transit corridors. Very limited public parking is available in the downtown area, and most employers offer transportation subsidies, especially to low-skilled and low-paid employees. The popularity of Curitiba’s BRT has effected a modal shift from automobile travel to bus travel. Based on 1991 traveler survey results, it was estimated that the introduction of the BRT had caused a reduction of about 27 million auto trips per year, saving about 27 million liters of fuel annually. In particular, 28 percent of BRT riders previously traveled by car. Compared to eight other Brazilian cities of its size, Curitiba uses about 30 percent less fuel per capita, resulting in one of the lowest rates of ambient air pollution in the country. Today about 1,100 buses make 12,500 trips every day, serving more than 1.3 million passengers—50 times the number from 20 years ago. Eighty percent of travelers use the express or direct bus services. Best of all, Curitibanos spend only about 10 percent of their income on travel—much below the national average. This article is excerpted from a Federal Transportation Administration publication on Issues in Bus Rapid Transit. Bert Arrillaga, chief of the Service Innovation Division in the Office of Mobility Innovation, provided guidance and overall direction for its content. Staff members from both the Federal Transportation Administration and the Volpe National Transportation Systems Center (Volpe Center) participated in its writing. Adapted for publication in RP&E by B. Jesse Clarke. Download or view a pdf of this article (118 KB). Does the Marin Transportation System Shut Out People of Color?